On trips to China and Serbia it became obvious that there is an interest in the massive East German electric mining locomotives. Between 1952 and 1988 the manufacturer LEW Hennigsdorf produced 1,384 locomotives of their class EL2. Half the number was exported to other, at that time, socialist countries while the other half served the open cast mines in the GDR. This type was highly appreciated by the coal mine railroaders. Due to higher efficiency and the decline of mining activities in East Germany, only around 50 of these locomotives survive today. Two companies are still using these electrics: Vattenfall Mining Europe, around Cottbus and the MIBRAG in Profen, south of Leipzig. It was a common sight to see these locomotives running deep into the open cast pits and getting their trains loaded at the bottom of the mine from a huge coal mining bridge or excavator. Nowadays there are central loading points outside the mines. The coal moves there via conveyor belts which cover the whole mine. In the central loading point the coal goes into self discharging wagons. However, there is still one open cast mine where they’re using the traditional way of loading at the bottom of the pit: Cottbus Nord. This open cast mine will be out of coal by 2015 and, for that reason, they didn’t invest in a central loading point for this mine. As a normal visitor you only have the chance to view from one of their viewing points, using a long lens and seeing less than half of the locomotive down in the pit. The open cast mine is often not working and you’ll see no train at all. Currently they use this mine when their more productive mines need to be stopped to carry out maintenance. We’ll not build our tour on luck, instead we’ve arranged a visit to the bottom of the mine with Vattenfall. They’ll also run trains on the day we’re there, so that we’ll not have a wasted trip into the mine. Last but not least they will issue a photo permit for our group. 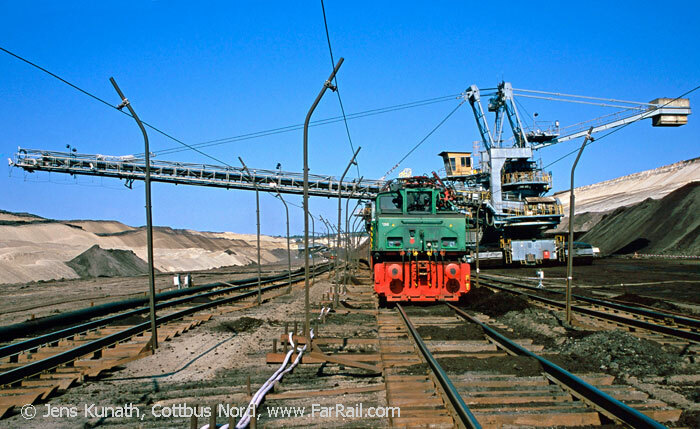 Pictures of the regular running trains of the open cast mine, Profen. In the late afternoon we’ll continue to Schkeuditz, where our tour will end at the airport Leipzig/Halle (LEJ) around 17 hrs. The railway connects the central loading points at the mines with the power plants and the interchange yards of the state railway. There are a number of good photo positions although there are no spectacular mountain sections. Vattenfall Mining Europe has some double tracked main lines with dense traffic. They use around 30 electrics of the class EL2. Almost all of them have been overhauled and modernised between 2006 and 2010 in the state railway workshop at Cottbus. The companies own workshop is in Schwarze Pumpe. 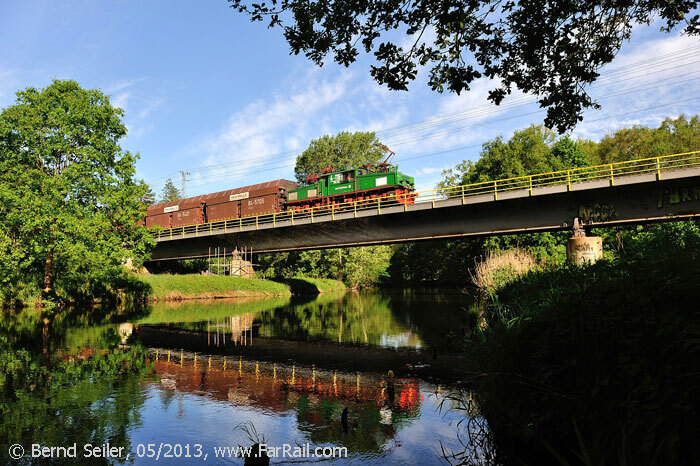 Besides the electrics they also have a number of East German diesel locomotives in use. On the Vattenfall lines we’ll find rural positions in the fields, forests, crossing the River Spree, as well as industrial backdrops, some modernand some not so modern. The highlight will be of course the shots at the bottom of the open cast mine. 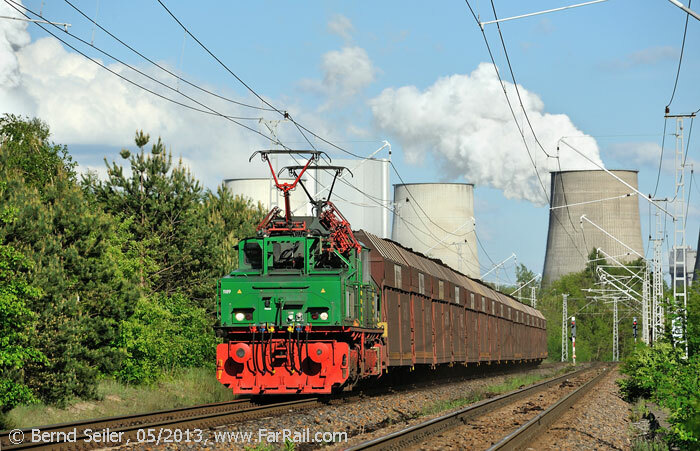 Besides coal trains they’re also running trains with the ash from the power plants and gypsum. Some trains are double headed. The network of the MIBRAG, at the open cast mine at Profen, is much smaller than the Vattenfall one. The number of possible photo spots is hence limited. On the other hand you find the class EL in the non-modernised version, still looking very much the same as they did in the 1970s. Profen haven’t replied to our request for a photo permit so far. That’s why we’ll focus on the photo positions which can be reached from public ground (most areas of the railway are accessible). The traffic is sometimes dense but sometimes you have big gaps in between two trains. You can find double headed trains here as well. 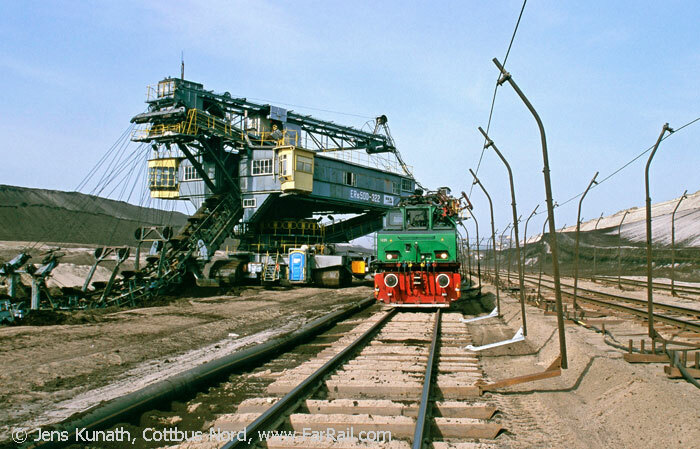 The tour is designed with the dedicated railway photographer and video film maker, interested in the elderly electric locos of the East German open cast mines. It is not suitable for the environmentalist or investigative journalist. If you belong to this group you need first to sign in for a visit to a Chinese or Bosnian open cast mine to get an idea how environmentally friendly they operate the mines in Germany. The chosen middle class hotels have their price. If you want to save money you can also choose a cheap pension nearby. We’re using self driven minibuses. For this tour it’s essential to wear appropriate shoes. We’ll move around and on railway property where the loco crews do not expect to see photographers next to a track. These are no museum lines where employees are used to photographers. A loco driver doesn’t know that we know the profile of his train. In case of doubt it’s likely that he’ll try to stop in front of you. That’s why you shouldn’t stand close to the track if you want to avoid any disruption to the regular traffic. We need to accept that on these industrial railways things might be different from what you know from other railways. On double tracked lines trains can use both tracks, the left or the right one. You don’t know from which side and on which track the next train will come. Electric locos can approach very quietly, be careful and never chose a photo position in the profile of a railway. All trains run on requirement, not to a fixed schedule. Especially on the MIBRAG railways you should expect some longer breaks. 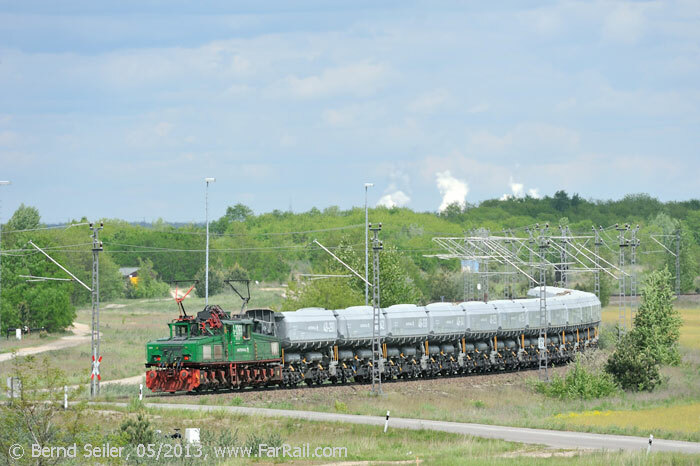 Except for the arranged turns into the open cast mine in Cottbus Nord, we won’t have any influence on the traffic. In the best case we’ll receive information in advance on which section we can expect a train soon. However, even without this information, it’s possible to see many different trains on railway networks. We’ll find many opportunities to take pictures of these traditional electric locomotives. At least around Cottbus the traffic is dense in the morning and the afternoon. It slows down around noon. Always use common sense when crossing roads and railway tracks. Neither Vattenfall, MIBRAG nor FarRail Tours can be held responsible and will not accept any liability whatsoever in the case of any accident or damage. Everyone is responsible for his own, railway and mining appropriate safety behaviour. We suggest you take out a comprehensive accident and health insurance policy.